It’s been a few years since I launched into a single action revolver project, and I got that ole urge again (Farmer Frank James would recognize the feeling in a heartbeat!). 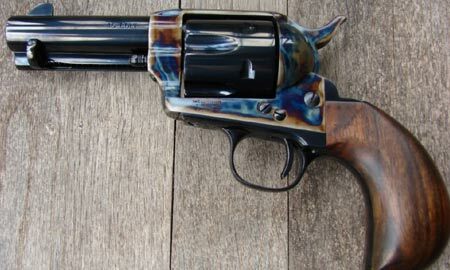 The photo above is one of the classic old Texas Longhorn Border Pistols created by the late Bill Grover… I cribbed the picture from my friend Lee Martin’s great Singleaction.com site, the place for single action fans. You can read a lot more on the Texas Longhorn guns in John Taffin’s classic masterwork SINGLE ACTION SIXGUNS. I was thinking of something like that in .44 Magnum, to be shot mostly with specials. I’ve got an old blue .44 Magnum Vaquero that has seen better days… it was one of the NSSF Media Program guns I bought after the program shut down, so it had 5 years on the road (and put up wet more than once!). I shot cowboy action with it for a while after that, giving it a nice sanding of holster wear. I stumbled onto a Ruger birdshead gripframe while I was sifting through Midway USA for ammo recently, and as it was a factory replacement part, it was cheap and I snapped it up. I’ve also got a lot of Ruger single action parts in the parts bin, so there’s no worry on that part. Not 100% on it yet, but it would be a cool later summer project.